Medford residents Frank and Jane Sharp moved to South Jersey last year. As they became acquainted with the region, they found one small problem. There was nowhere in South Jersey where they could partake in their favorite activity, curling. This predicament led to the pair creating the Jersey Pinelands Curling Club, the first organized curling league in South Jersey. The club has been gathering on Tuesday nights this summer at the Igloo Ice Rink in Mt. Laurel. Experienced members give a short lesson to newcomers to the game before everyone breaks off into teams to play matches. Bringing the club to fruition involved a bit of legwork. The Sharps talked to multiple ice rinks in the area to see who would want to host a curling league. After talking with management at the Igloo, there was no question where they would be hosting their club. “The Igloo was definitely the most interested,” Jane said. The Sharps first became interested in curling after watching it during the 2010 Winter Olympics. They used this year’s Winter Games as a springboard to get new members. It has worked, as the club now has 30 full-time members and six substitutes who fill-in from time to time. 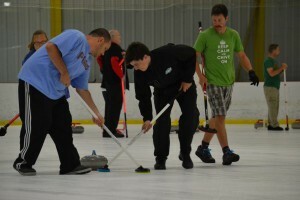 The members contain a mix of experienced curlers and newcomers to the game. Deptford resident Leslie Gray had been curling for a number of years. Previously, she was forced to drive near King of Prussia to play. Now, her drive is much shorter. “I love my Philly people, but this is a lot closer for me,” she said. Gray has provided a helping hand to players such as Michelle Bade and Debbie Kingsland who are new to the game. The pair became interested in the sport after seeing it during the Olympics. “There was an open house (in South Plainfield), but we weren’t able to get in,” Kingsland said. The pair got involved with the Jersey Pinelands Curling Club after attending a “Learn to Curl” class, which is held once a month as an instructional session for anyone who wants to join. Frank said the classes have helped bring in more members as the weather has turned warmer. After a beginner attends one of the classes, they are invited to start attending the club. “Over the course of the year, everyone who wants to play can,” Frank said. Having a steady and dedicated membership is crucial to the club. They play each week on one of the Igloo’s hockey rinks. There is no dedicated curling rink, and the hockey rinks do not have curling lines or houses painted on. Members arrive early to set up five separate rinks running parallel to each other on the hockey rink. They also stay late to clean everything up. The Igloo helps with preparing the ice and also allows the club to store equipment in its freezers. 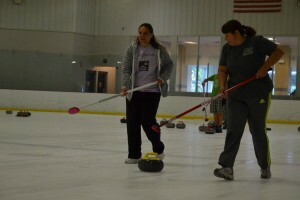 The club has one “Learn to Curl” class left this summer on Tuesday, Aug. 12 at 6 p.m. While the class will be taking place too late for the summer season, a new season will begin in the fall. 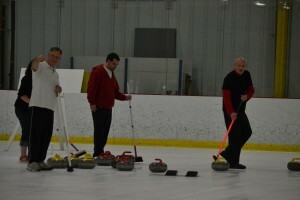 For more details, visit www.jerseycurling.org.